Lewisham’s answer to the top Turks of Green Lanes: a prime source of pides and grills. Refurbished in 2013, and moving a notch upmarket in the process, Meze Mangal remains the area’s top Turkish restaurant. We reckon it’s the match of many on north London’s Green Lanes. The decor now features parquet flooring, spotlights and long tables, but it’s the charcoal grill that still takes centre stage. 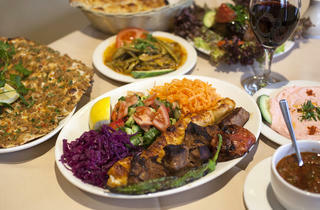 From here comes the likes of bıldırcın (grilled quail) and patlıcan kebab (aubergine with minced lamb). Nevertheless, it’s on the list of freshly baked pide breads where you’ll find the best value; toppings range from spinach, onions and cheese to Turkish sausages with cheese, egg and tomatoes. A decent choice of meze dishes and Turkish wines boosts the appeal. 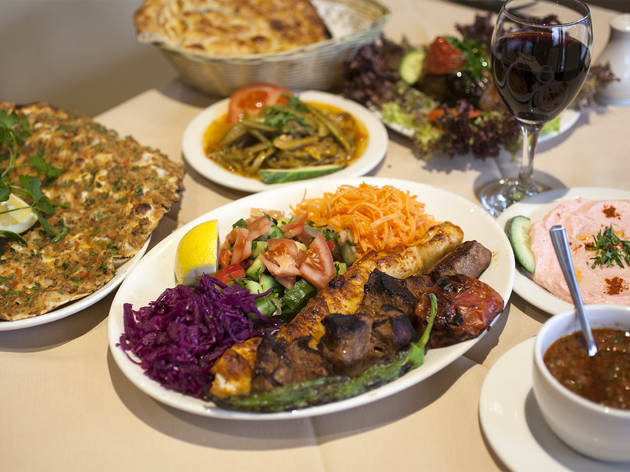 We have been going to Meze Mangal for over 15 years and the food and service have always been great, won't go to any other Turkish restaurant as it can't be beaten. Amazing Turkish food! The mezze platter to start is massive and great value for money. You can't beat the freshly baked hot flatbread too. I've eaten here a couple times and it is very difficult to save room for the main course. Highly recommended! Still the best restaurant in South London. Impressive food, fantastic service, charming owners. We go time and time again. I eat here to celebrate my birthday every year. It is so good. I decided to bring my parents here for a quick lunch today, based on the good reviews posted on TimeOut. We were not disappointed. Originally, we were served by a most helpful gentleman who bent over backwards to make our meal as good as possible, including after I asked whether there was yeast in the pide (which there was) bringing me a basket of unleavened 'lewasa', which was yeast free and specially for me to enjoy with our humus starter. The garlic prawns to start were amazing, seriously tasty, and the minced chicken and minced lamb kebabs were superb with delicious yoghurt to accompany. I made a point of picking up a take away menu when we paid the bill and asked the original gentleman's brother, who had taken over, if it would be possible to have a pide take away using yeast free dough. The nice man scurried away to ask the kitchen and confirmed exactly what I needed to ask for over the phone. I can't recommend this place highly enough and will be back very soon. Absolutely amazing food! We have the shared starter which had amazing homemade dips and salads with gorgeous hot homemade bread. We have chicken and lamb dishes which came which different salads. We couldn't manage anything else as we were so stuffed. Staff were very friendly . Amazing food, amazing people, amazing atmosphere. Amazing. very good atmosphere, fresh excellent food. must like mediterranean food! The Best thats all I have to say! We are locals to this place and, despite trying other turkish restaurants within the area, this is the best by a mile! The service is consistently brilliant - all the staff are kind, attentive and go over and above to make you happy. The food is fresh, tasty and authentic, with a great selection of pide or kebabs which are chargrilled right in front of you. They strike a unique balance - the reason you leave so stuffed is not just because the portion is generous, but because you do not want to leave a single crumb. This is a real gem right in the heart of Lewisham - from its authentic turkish coffee to its wonderful homemade breads and humus, this place has the details bang on. I just cannot fault it, I really can't. This is the worst food and service we have ever had. the staff was really ignorant rude... Avoid to go there mc Donald will be much better for your stomach and mind. great food, however as we finished our lovely food with in five mins the little man who runs the place kindly told us to leave because other diners were waiting for the table not a good move for!!! Excellent. We booked a table for 4. Great choice of food which all arrived at our table promptly and it was all extremely tasty! Large portions, very friendly staff, reasonably priced. What more could a hungry person want?